This morning when I read God’s question to Cain it led me to ask the opposite question: Why am I not angry? We’ve all seen people who are most often motivated to action by anger. The best way to get them up and going is to get them mad. Bet on it, it’s like walking on egg shells living with them. Not being angry doesn’t mean you do not care; it simply means your motivation for action comes from a different source. 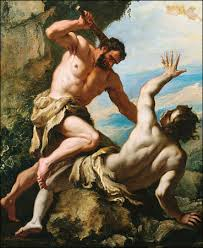 Just think, for example, if Cain’s motivation for action had been love—do you think he would have murdered his brother Abel? Even if Cain’s motivation for action had been as basic as survival, murdering his own brother would not have come into the picture. Yes, to not be angry today is such a blessing. The ONE THING for today is to answer this question: Why am I angry or not angry? The answer to that question is going to go a long way in determining the kind of day you have and the kind of day the people you share this day with will have. anger, wrath, malice, blasphemy, filthy language out of your mouth.